As a town of science, Dubna dates from the time immediately after the end of World War II. In 1947 a group of scientists led by Academician I. V. Kurchatov initiated construction of the then largest accelerator of charged particles - synchrocyclotron - on the bank of the Volga river, 120 km from Moscow. The accelerator was commissioned already in 1949. 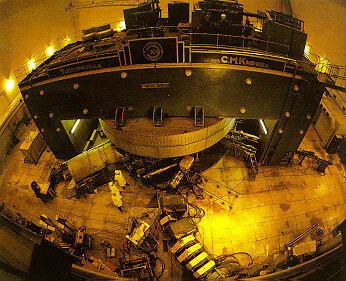 Extensive fundamental and applied investigations into the properties of nuclear matter immediately started at the newly-established Institute for Nuclear Problems (INP) with its operating 680 MeV synchrocyclotron, headed by young physicists M. G. Meshcheryakov and V. P. Dzhelepov, later world-known scientists and Corresponding Members of the USSR Academy of Sciences. After the INP, the Electrophysical Laboratory of the USSR Academy of Sciences (EFLAN) was set up in Dubna. It was headed by Academician V. I. Veksler and its work was concentrated on construction of a new accelerator, namely a synchrophasotron with the record parameters for that time. By the mid-1950s the world had come to realize that nuclear science could not be locked in secret laboratories and that only wide international co-operation could ensure progress in this fundamental realm of human knowledge and peaceful utilization of atomic energy. In 1954 the European Organization for Nuclear Research (CERN) was established near Geneva to unite the efforts of West European countries in studying the fundamental properties of the microcosm. About the same time, under the stimulus of the USSR Government, the countries then belonging to the socialist world took a decision to establish the Joint Institute for Nuclear Research on the basis of the INP and EFLAN. The agreement on the establishment of the Institute was signed on 26 March 1956 in Moscow. The same year specialists from 12 countries came to Dubna. The town became international. Investigations in many fields of nuclear physics of interest for research centres of the JINR Member States were launched here. The history of JINR is associated with such outstanding scientists as D.I. Blokhintsev, N.N. Bogoliubov, H. Hulubei (Romania), L. Infeld (Poland), L. Janossy (Hungary), I.V. Kurchatov, H. Niewodniczanski (Poland), A.M. Petrosiants, E.P. Slavsky, I.E. Tamm, A.V. Topchiev, and many others. What is JINR today? It is a world-known centre for fundamental nuclear research where scientists unite their efforts to gain better insight into the surrounding world. Besides, here the fundamental research is combined with applied investigations and university education. JINR has at present 18 Member States: Armenia, Azerbaijan, Belarus, Bulgaria, Cuba, Czech Republic, Georgia, Kazakhstan, D. P. Republic of Korea, Moldova, Mongolia, Poland, Romania, Russia, Slovakia, Ukraine, Uzbekistan, and Vietnam. Participation of Germany and Hungary in JINR activities is based on bilateral agreements signed at the governments' level. In the past six decades JINR has grown into a large many-branch physics centre. It employs over 6000 people, including 1000 scientists, about 2000 engineers and technicians. Among the scientists there are 10 full members (academicians) and 8 corresponding members of Academies of Sciences, over 230 Doctors of Sciences and 680 Candidates of Sciences. Director of JINR is the Academician of the Russian Academy of Natural Sciences and the Russian Academy of Engineering Sciences Professor V.A. Matveev, Vice-Directors are Professors M.G. Itkis and R. Lednický. JINR comprises eight Laboratories, each being comparable with a large institute in the scale and scope of investigations performed. The Laboratories are headed by Professors V.A. Bednyakov, S.N. Dmitriev, D.I. Kazakov , V.D. Kekelidze, V.V. Korenkov, E.A. Krasavin, S.Z. Pakuliak, V.N. Shvetsov. U-400. In 1993 a beam of ions was extracted from a new accelerator U-400M. In 1993-1994 a superconducting accelerator of relativistic nuclei, nuclotron, was put into operation. Research is also carried out with a pulsed fast-neutron reactor IBR-2 and a neutron booster IBR-30. In 1994 the project IREN entered the implementation stage, which means construction of a high-current pulsed source of resonance neutrons. JINR is a scientific centre equipped with powerful and fast computation means integrated into the world computer nets. Three main avenues can be singled out from JINR's wide range of investigations. Elementary particle physics: investigation into production and interaction of particles is the most direct way of comprehending the structure of matter. JINR scientists carry out research in this field not only at the accelerators in Dubna, but also in other scientific centres: CERN, IHEP (Protvino, Russia), FNAL (Batavia, USA), DESY (Hamburg, Germany). Another avenue of investigation is nuclear physics. Here one studies nuclear properties, nuclear reactions, new elements, including transuranic and superheavy ones. Our Institute is one of the world leaders in this field. The third avenue is condensed matter physics. This field of fundamental science has shown rapid progress, particularly in the recent years. Experimental methods of nuclear physics are applied to study physical phenomena in solids and liquids, new properties of materials. Many first-class achievements belong to Dubna physicists. JINR accounts for a half of the discoveries (about 40) in nuclear physics, registered in the USSR. Many of them have been awarded different international and national prizes and state decorations for investigations carried out at JINR. Among the latest achievements of the Institute is the programme of superheavy elements' search, and it deserves special mentioning. Scientists of JINR have recently synthesised new long-life superheavy elements with numbers 113, 114, 115 and 116, 117 and 118. These discoveries crowned 45 years of the effort by experimental physicists in different countries who have been searching for the "stability island" of superheavy nuclei. About 500 papers and reports representing about 3000 authors are submitted by JINR to editorial boards of journals in many countries and to organizing committees of conferences every year. JINR publications are sent to over 50 countries. JINR is a truly international institution. Its supreme governing body is the Committee of Plenipotentiaries of all 18 Member States. The scientific policy of JINR is established by the Scientific Council, whose members are prominent scientists from the Member States and well-known physicists from CERN, France, Germany, Italy, and the USA. Scientists from physics centres of JINR Member States are involved in virtually all topics of the JINR Topical Plan for Research. Important scientific results were obtained in joint investigations with the Institute for High Energy Physics (Protvino), Russian Scientific Centre "Kurchatov Institute" (Moscow), Institute of Nuclear Physics (Gatchina), Institute of Theoretical and Experimental Physics (Moscow), Institute for Nuclear Research (Troitsk), Institute of Physics of the Russian Academy of Sciences (Moscow), Budker Institute for Nuclear Physics (Novosibirsk), etc. For many years JINR has been fruitfully collaborating with CERN, which allows speeding up solution of many theoretical and experimental problems in high energy physics. Scientific collaboration with many centres of physics in the Germany, the USA, France, Italy, Switzerland, China, and other countries has been successfully developing, especially in the recent years. JINR maintains mutually beneficial relations with the IAEA, European Physical Society, and International Centre for Theoretical Physics in Trieste. Every year about a thousand scientists from institutions collaborating with JINR come to Dubna. JINR grants fellowships to physicists from developing countries. Scientists of the Joint Institute take part in many international and national scientific conferences. In its turn, JINR holds up to 10 large conferences and over 30 international workshops a year. Schools for young scientists have become a tradition at JINR. The Joint Institute has long been called a scientific school of high quality. Many scientists and engineers from the Member States were trained in this school. The careers of many outstanding scientists are associated with it. This role of JINR is predetermined by its establishment principles and by scientific schools of D.I. Blokhintsev, N.N. Bogolubov, G.N. Flerov, I.M. Frank, B.M. Pontecorvo, V.I. Veksler, and other outstanding physicists. JINR means high skill of specialists and good conditions for training and education of talented young people. Over 30 years a branch of Moscow State University has been working in Dubna. In 1991 a JINR University Centre was set up. Here senior students of Moscow University, Moscow Engineering Physics Institute, Moscow Institute of Physics and Technology, and from other Russian institutes finish their training under supervision of leading scientists of JINR, taking a practical course in the JINR Laboratories as well. In 1995 postgraduate studies were organized at the Institute. A few years ago a new development concept was launched at JINR with a goal to turn it into an international centre combining fundamental research, engineering development, and education. On the initiative of the JINR Directorate and with active support of the Russian Academy of Natural Sciences, Moscow Region and Dubna administrations, an international university "Nature, Society, Man" was established in Dubna, the first students entering it in 1994. The Council of the International Union of Pure and Applied Chemistry (IUPAC) approved the name dubnium for the element of atomic number 105, the name flerovium for the element 114 in honor of the Laboratory of Nuclear Reactions of JINR and the founder of FLNR Academician G.N. Flerov, the name moscovium for the element 115 in honor of of the Moscow region and the ancient Russian land that is the home of JINR, and the name oganesson for the element 118 in honor of Academician Yuri Oganessian (FLNR JINR) for his pioneering contributions to transactinoid elements research. That demonstrates the international recognition of the achievements of JINR’s staff of researchers and their contribution to modern physics and chemistry. For more than 20 years, JINR has been participating in the implementation of the programme to establish an innovation belt in Dubna. In 2005, the RF government signed the Resolution "On the establishment of a special economic zone of the technology-innovative type in the territory of Dubna". The specific character of JINR has been revealed in the SEZ appeal: nuclear physics and information technologies. More than 50 innovative projects have been prepared by the Joint Institute to be implemented in the special economic zone; 9 companies - "Dubna" SEZ residents have their origin at JINR. JINR today is an internationally recognized centre for fundamental nuclear studies where scientists unite their efforts to gain better insight into the surrounding world. The fundamental studies under way here are combined with applied research and university education in the relevant fields of knowledge.